We are happy to ship and export worldwide. We have available outstanding brown, silver and snow rosetted and marbled kittens for either breed/show or pet. Our Bengal breeding programme is subject to the same high standard we demand in our Savannah breeding programme. 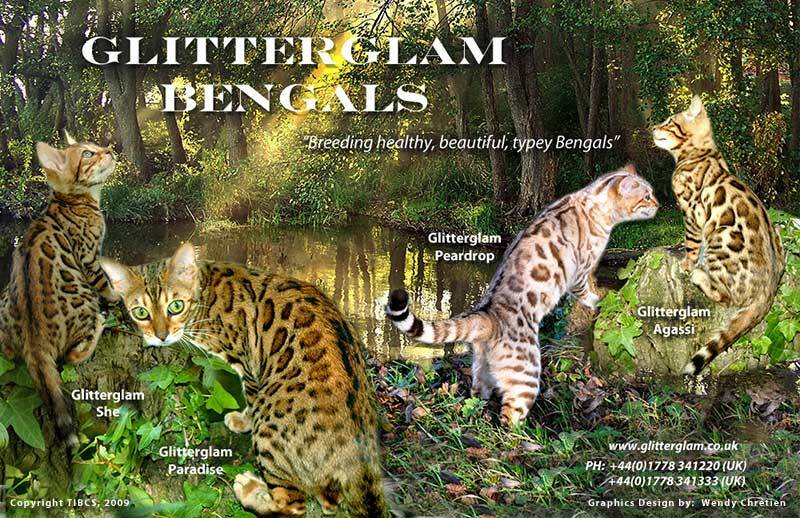 We look for large rosetted Bengals, be it in our brown spotted, or silver breeding programme and only the highest quality is acceptable for our continued success in Bengal breeding, producing show winning stock or exotic pet, time after time. 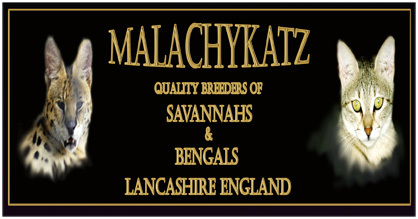 MalachyKatz are equally passionate over the temperament of our cat's, and as with the Savannahs, all Bengal kittens are litter trained, vaccinated, and very importantly socialised within a family environment, to ensure maximum happiness to both customer and kitten in their new home. Our Bengals are subject to the same contract as our Savannahs, as we want them to be as happy as we know their new owners will be with their choice. We specialize in stunning, quality Silver Bengal's chosen very carefully from the best American blood-lines, concentrating on their wild confirmation and profile. Our kittens are bred for their superb muscular, wild type, stunning leopard markings and rosettes, with extreme contrast. They also have wonderful temperaments and fantastic socialization skills. Our Savannahs and Bengals are sourced from excellent breeding stock from some of the best Savannah and Bengal lines in the UK, America and Europe. 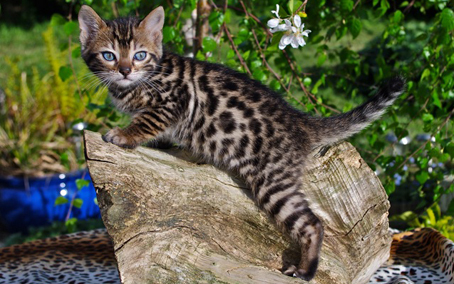 Our aim is to produce strong healthy Bengal kittens/ Savannah kittens combining gorgeous coats with bold markings and extreme type to ensure exotic looking Bengals and Savannahs that will further the aims of both breeds. We are members of TICA, The Bengal Cat Club of Great Britain and The Savannah Cat Club of Great Britain. 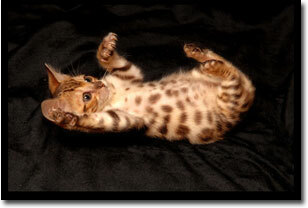 Please see our website for Savannah and Bengal kitten availability.